Although a generally LOW avalanche danger exists in the Turnagain Pass region, there are a few exceptions that are keeping areas of 'yellow' in the picture. These are cornice falls, lingering wind slabs, glide avalanches and sluffs. First, a MODERATE danger exists along ridgelines where human triggered (or natural) cornice falls are possible and could trigger an old wind slab below. Second, a MODERATE danger exists at the mid-elevations where large glide cracks may release into destructive avalanches. And last, watch your sluff, these are expected to be fast moving with moderate to large volumes today. *If you are thinking of going to the Summit Lake area, be aware that different avalanche problems exist within the snowpack. Click HERE to read yesterday morning's Summit Lake Summary. This avalanche was on the West face of Lipps ridge and released at 1pm yesterday. Skiers on the Cornbiscuit ridge reported seeing a powder cloud and snow in motion. At this point the trigger is unknown. There were skiers on the Lipps South face skin track; around the corner. There were no tracks leading into or out of the slide and no tracks near it on the ridge. We suspect this was a large wind slab triggered by a natural cornice fall. We have not seen any persistent weak layers that would lead us to believe this was remotely triggered by skiers on the South face. If anyone has further information on this slide please send us an observation or an email! Photo of the Lipps avalanche. Many more photos can be seen HERE. Cornice falls and wind slabs today? With another clear sky day and light winds on tap, we are expecting very similar 'mostly' stable avalanche conditions. This means watching for lingering wind slabs in very steep rocky terrain and giving cornices a wide berth - see photo below. The sun is just starting to affect the snow and could help tip the balance for cornices on the verge of breaking. Keeping a look out for stiff hollow feeling snow and smooth wind pillows are good ways to suss out wind slabs on the steeper slopes. Photos below: Left photo (by Adrian Beebee), skier track on a chunk of cornice that was triggered on Tincan - close call!! 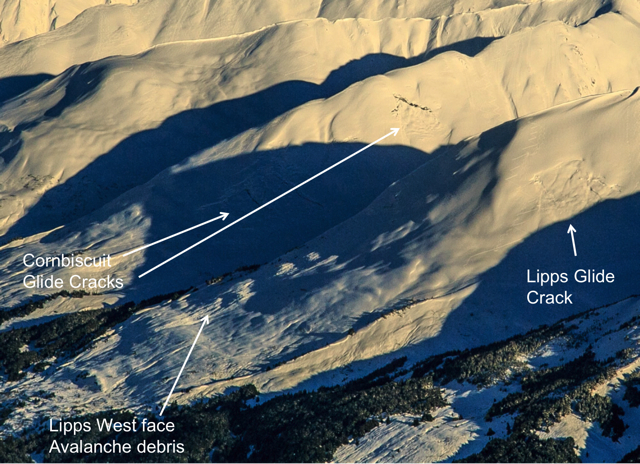 Right photo (Louis Sass), large natural cornice fall in upper Lyon creek. We were expecting a glide release or two yesterday with the cooler temperatures and clearing skies but, no, we did not see any. It looks as though the glide cycle may be slowing down? Regardless, limiting/avoiding time under glide cracks remains prudent. Sometimes it's hard to know if you are under a yawning glide crack if you can't see the whole slope. Sluff management! This will be one of those days that sluffs could be large, run quickly and catch you if you're not looking. Yesterday's nice day consisted of clear skies, light and variable winds and temperatures in the upper teens to low 20's F.
Overnight temperatures have warmed at the upper elevations and cooled at the lower. An inversion is in place this morning with ~25F on the ridgetops and ~15F at 1,000'. Skies remain clear and should stay that way for today. We can expect temperatures to warm slightly through the day with the winds turning Easterly and picking up to the 10-15mph range by sunset. Monday, we are expecting a weak frontal band to move through from the East. A bump in Easterly winds, cloud cover and a chance for 1-2" of snow is expected.